Lots and lots of people compete in events that test their physical limits. Many people choose to embark on a running adventure — say, finally tackling that 5K race or going all out and attempting an ultra-marathon. Still, others seek to compete in their first triathlon, while some might have a different physical challenge that’s on their horizon. Whatever you do, how you train is going to impact how well your body does and how strong you become. The mistake for many people is just reaching for repetition of the event that they’re competing in — say, running several times a week to train for a race. Your body needs more; it needs the right combination of aerobic or cardio and strength of flexibility. But, how do you figure out your mix of exercise? Well, in part it depends on your goals — and then you adapt based on the time you have! The following tips and graphics offer some good guidance to get started! Similar to the old “chicken or egg first” adage, deciding whether cardio or strength training comes first can be a real puzzle. And like any other fitness question, the answer is likely, “It depends,” when prioritizing resistance and aerobic training to fit your goals. 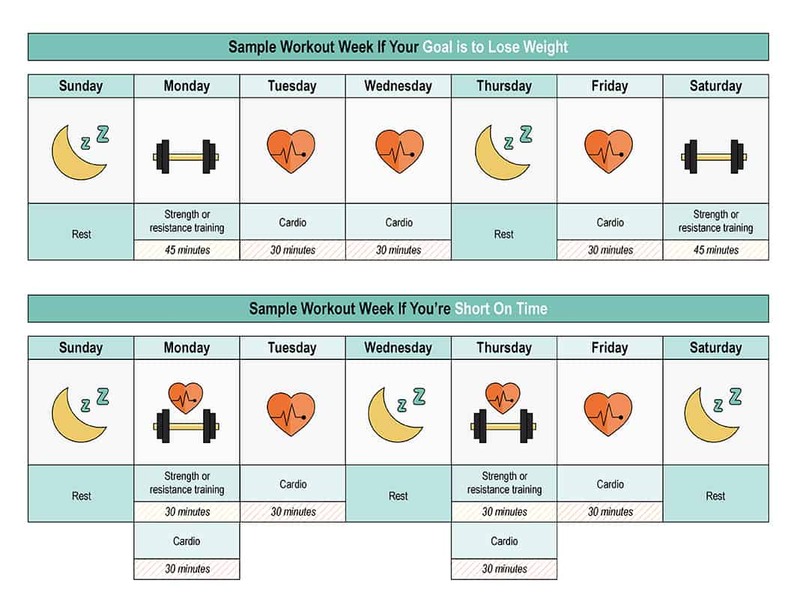 But if including strength and cardio feel like a chore, it can be hard to balance each week. Many gym-goers lose their enthusiasm when exercise becomes too routine because they churn through the same workouts every week. Check your gym schedule to find new classes or partner with a friend for buddy workouts. Take your workout outdoors or switch up your treadmill stint for a jaunt in the “mountains.” The key to staying fit and healthy is to make exercise fun. Before you abandon or reject the weight room, know that resistance training offers far more benefits beyond reducing fat stores. Pumping iron or even your own bodyweight increases lean body mass, improves bone density and joint health, and increases your body’s ability to burn more calories throughout the day, a process known as excess post-exercise oxygen consumption (EPOC). The takeaway for people who’d like to lose weight: Aerobic exercise is a surefire way to kick-start your goals, but weight training can totally transform your body composition for the better. 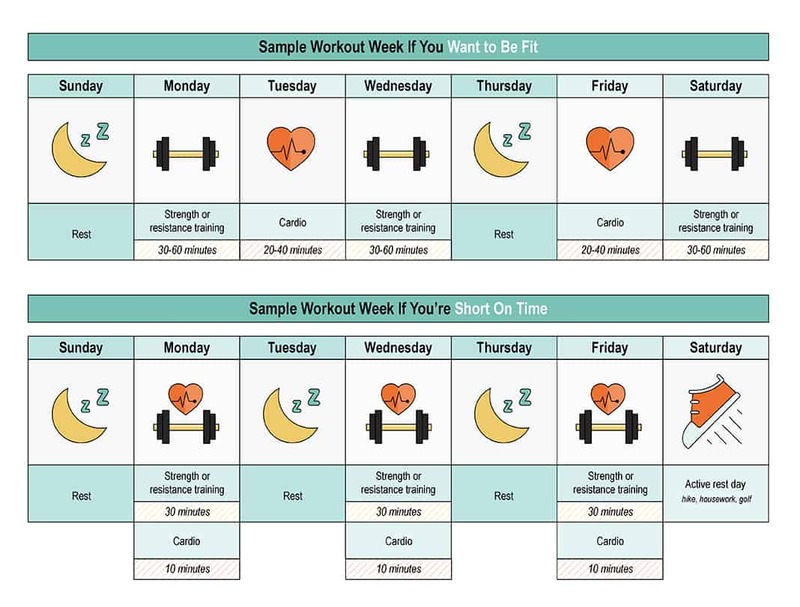 To achieve the most benefits, a solid workout week will include both aerobic and resistance training exercise. For general wellness, stick with what you love most so you can stay on track. Make it fun, mix it up, and try something new so you stay consistent and improve your health. * Article originally published on Northwest Pharmacy’s Health Perch.